Source of title proper: Title based on creator of records. BC Rail - known as the British Columbia Railway between 1972 and 1984 and as the Pacific Great Eastern Railway (PGE) prior to 1972 - was a railway that operated in British Columbia between 1912 and 2004. It was a class II regional railway and the third-largest in Canada, operating 2,320 km of mainline track. Primarily a freight railway, BC Rail also offered passenger service, as well as some excursion services, most notably the Royal Hudson excursion train. Its operations were owned by the public as a crown corporation from 1918 until 2004, when the provincial government leased operations for 999 years to CN Rail. The Pacific Great Eastern Railway (PGE) was incorporated on February 27th, 1912. The primary goal of the PGE was to complete a rail line heading north from Vancouver to Prince George where it would connect with the Grand Trunk Pacific Railway (GTPR). The PGE was privately owned until 1918 when it encountered financial difficulties and was taken over by the British Columbia Government as a Crown Corporation. By 1921 the railway had expanded to a point north of Quesnel but was still 80 miles south of the connection at Prince George. There were no large urban centers on the rail line during this time and it was primarily used for logging and mining operations from British Columbia’s interior to Squamish. In 1949 the PGE began to expand and on November 1st, 1952 the PGE completed a junction with Canadian National Railway in Prince George. On August 27th, 1956 the PGE completed a line between Squamish and North Vancouver thus completing its original goal of a rail line from Vancouver to Prince George. In 1958 the PGE reached Fort St. John and Dawson Creek to meet with the Alberta Railways, and on September 10th, 1971 a rail line was largely extended to connect Fort St. John to Fort Nelson. In 1972 the Pacific Great Eastern changed its name to British Columbia Railway (BCR). 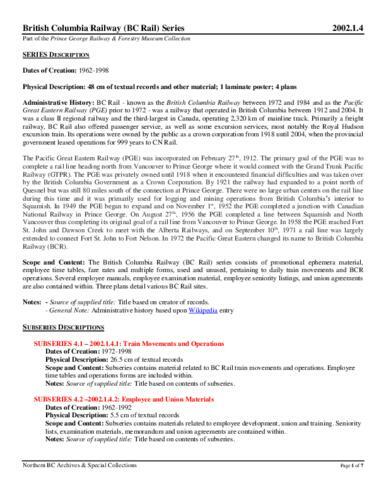 The British Columbia Railway (BC Rail) series consists of promotional ephemera material, employee time tables, fare rates and multiple forms, used and unused, pertaining to daily train movements and BCR operations. Several employee manuals, employee examination material, employee seniority listings, and union agreements are also contained within. Three plans detail various BC Rail sites.